Hip flexor tendonitis is most often due to overuse of muscles. Cyclists, long distance runners, and triathletes are susceptible to these soft tissue injuries due to volume of exercise. The muscles, and especially the tendons, are simply falling victim to wear and tear. 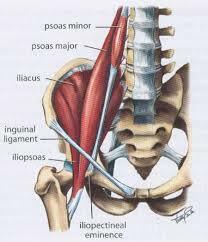 The major players in the hip flexor muscle group are the psoas major muscle, which is attached to the lumbar spine and the pelvis, the smaller psoas minor muscle, and the iliacus muscle. It is the large psoas muscle that is most susceptible to a hip flexor injury, and it is also the tendons associated with this muscle where tendonitis affecting the hip flexor is most likely to be centered. Our hip flexor muscle group goes from our lumbar spine at a 45 degree angle to attach into the medial portion of our hip. Spasms of this muscle or irritation of it can cause pain and inflammation of the tendon where it attaches to the bone. Pro longed sitting or standing can increase the risk of having this issues, especially if you don’t stretch this muscle out before activity or sports. 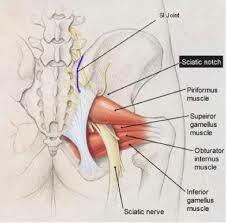 Sciatica refers to pain that radiates along the path of the sciatic nerve. The sciatic nerve is a thick and long nerve in the body. It passes alongside or goes through the piriformis muscle, goes down the back of the leg, and eventually branches off into smaller nerves that end in the feet. Nerve compression can be caused by spasm of the piriformis muscle. Sciatica also occurs when a herniated disk or a bone spur on the spine compresses part of the nerve. This causes inflammation, pain, and often numbness in the affected leg. Typically, sciatica affects only one side of your body. Piriformis syndrome usually starts with localized pain, tingling, or numbness in the buttocks. Pain can be severe and extend down the length of the sciatic nerve down the back of the leg. The pain is commonly due to the piriformis muscle compressing the sciatic nerve, such as while sitting in a chair at a desk, sitting in a car seat, or with running, especially uphill. Pain may also be triggered while climbing stairs, applying firm pressure directly over the piriformis muscle, or sitting for long periods of time. 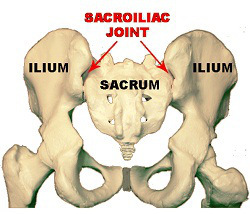 Sacroiliitis causes SI joint pain and is an inflammation of one or both of your sacroiliac joints. This is the place where your lower spine and pelvis connect. Sacroiliitis can cause pain in your buttocks or lower back, and may even extend down one or both legs. The pain associated with sacroiliitis is often aggravated by prolonged standing or by stair climbing. Sacroiliitis can be difficult to diagnose, because it may be mistaken for other causes of low back pain. It’s been linked to a group of diseases that cause inflammatory arthritis of the spine. Sacroiliitis may be felt as deep pain in the back or buttocks that typically gets better with activity. It generally is worst at night or in the early morning. Sacroiliitis is a common cause of inflammatory back pain. Symptoms of sacroiliitis tend to occur early on in the course of ankylosing spondylitis, and may be the reason your sacroiliac joints are tender if you have this disease. The hamstring and quadriceps muscle groups are particularly at risk for muscle strains because they cross both the hip and knee joints. Muscle strains usually happen when a muscle is stretched beyond its limit, tearing the muscle fibers. They frequently occur near the point where the muscle joins the tough, fibrous connective tissue of the tendon. A similar injury occurs if there is a direct blow to the muscle. Muscle strains in the thigh can be quite painful. Once a muscle strain occurs, the muscle is vulnerable to re-injury. It is important to let the muscle heal properly and to follow preventive guidelines from your doctor. A hamstring injury occurs when you strain or pull one of your hamstring muscles. The hamstrings are a group of three muscles that run along the back of your thigh. You may be more likely to get a hamstring injury if you play a sport that involves sprinting with sudden stops and starts. 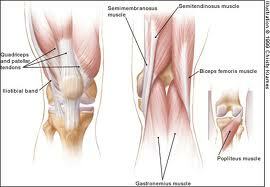 Hamstring injuries typically are very limiting and can present with black and blue bruising if tears occur. A quadriceps injury occurs when you strain or pull one of your four quad muscles that attach your hip to your knee at the kneecap. You may be more likely to injury this muscle if you participate in a sport that requires a quick or strong contraction of the quad, as in football, running, basketball, tennis or a similar sport that involves sprinting or sudden stops and starts. A hip labral tear involves the ring of cartilage, called the labrum, that follows the outside rim of the socket of your hip joint. The labrum acts like a rubber seal or gasket to help hold the ball at the top of your thighbone securely within your hip socket. Active adults between the ages of 20 and 40 are affected most often, requiring some type of treatment in order to stay active and functional. New information from ongoing studies is changing the way this condition is treated from a surgical approach to a more conservative (non-operative) path. It was once believed that a single injury was the main reason labral tears occurred (running, twisting, slipping). Improved radiographic imaging and anatomy studies makes it clear now that abnormal shape and structure of the acetabulum, labrum, and/or femoral head can also lead to the problem. 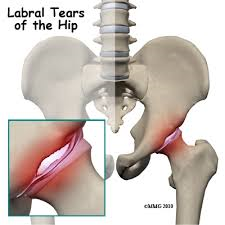 Injury is still a major cause for labral tears. Anatomical changes that contribute to labral tears combined with repetitive small injuries lead to a gradual onset of the problem. Athletic activities that require repetitive pivoting motions or repeated hip flexion cause these type of small injuries. Bursitis is inflammation of the bursa. Bursae, are small, jelly-like sacs that are located throughout the body, including around the shoulder, elbow, hip, knee, and heel. They contain a small amount of fluid, and are positioned between bones and soft tissues, acting as cushions to help reduce friction. 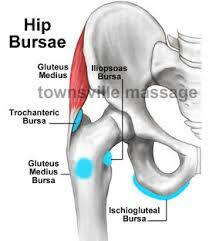 By far, the most common type of hip bursitis is from the trochanteric bursa. This can be injured in one of two ways, through a direct impact to the bursa, such as a fall onto the outer hip, which is known as traumatic bursitis, or through repetitive friction from the overlying muscles and tendons, usually during running. This repeated friction results in the bursa becoming inflamed and swollen. Every time the tendons then rub over the bursa, this causes pain. Typically, the pain is worse at night, when lying on the affected hip, and when getting up from a chair after being seated for a while. It also may get worse with prolonged walking, stair climbing, or squatting. Trochanteric bursa – outside of the hip between the greater trochanter and gluteal muscles.